The new Corsair replaces the MKC crossover as Lincoln's smallest luxury SUV. After unveiling the all-new Aviator last year, Lincoln has lifted the wraps off the new 2020 Corsair SUV at the 2019 New York Auto Show. 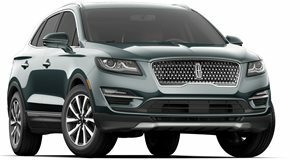 Featuring a fresh new look, a luxurious interior, and advanced tech, the new Corsair replaces the aging MKC crossover as the brand’s smallest luxury SUV and completes Lincoln’s new SUV family. 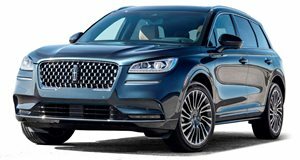 Visually, the new 2020 Corsair (inspired by the Latin word "cursus” meaning journey) borrows design elements from the full-size Lincoln Navigator and three-row Lincoln Aviator. Lincoln describes the design as a "sculpture in motion,” featuring sculpted S-curves and sides, and a "fast-falling” roofline. Inside, the new Corsair’s cozy cabin is designed to sooth the senses. A dual-wall dashboard in the engine compartment provides an additional barrier between passengers and the engine, creating an air gap that keeps vibrations out of the cabin – an innovation that’s usually only found in larger vehicles. Active Noise Control also enhances overall sound quality throughout. Six unique symphonic chimes replace standard electronic alerts, informing drivers of everything from an open fuel door to an unbuckled seat belt. Just like the Aviator, these audio chimes were recorded by the Detroit Symphony Orchestra. The horizontal interior design is crafted with hand-selected materials and enhances practicality with additional front-row storage. For audiophiles, a specially tuned 14-speaker Revel premium audio system is also available for the all-new Corsair. Placement, tuning, calibration and the number of Revel speakers are all unique to each Lincoln vehicle. Available wireless charging for compatible mobile devices is located in the front-row armrest, while a convenient media bin is available for passengers in front as well. Users can plug their mobile phone into their SYNC 3-equipped Corsair to access apps from an available 8-inch touch screen. Lincoln’s available Perfect Position seats offer 24-way adjustability, massage capability and additional lumbar support for driver and front passenger. Second-row passengers get more legroom and flexibility thanks to the sliding seats that offer up to six inches of travel and a 60/40 fold-flat or split-bench option. Lincoln claims the Corsair offers more legroom in the second row than many larger luxury SUVs including the Mercedes-Benz GLS and Tesla Model X. As standard, the new Corsair is powered by a turbocharged 2.0-liter four-cylinder engine with a targeted 250 horsepower and 275 lb-ft of torque, or this can be upgraded to a 2.3-liter version with a targeted 280 hp and 310 lb-ft of torque. Both engines are mated to a new 8-speed automatic transmission and are available with an intelligent all-wheel drive system that can switch between front- and all-wheel drive depending on road conditions. New rear integral bush suspension delivers a smooth ride by directly absorbing impacts that would otherwise be felt in the cabin. A wealth of customizable technologies are available including Phone As A Key technology allowing owners to use their smartphone to lock and unlock, open the liftgate and start and drive the Corsair. If the phone battery dies, a standard exterior keypad can be used to enter a backup code and gain access to Corsair. Phone As A Key can be easily deleted if a phone is lost or stolen. Also available is Lincoln’s head-up display, which shows selected information on the windshield instead of the instrument cluster, helping drivers keep their eyes on the road and hands on the wheel. Like all Lincoln vehicles, the Corsair comes with a suite of driver-assist features known as Lincoln Co-Pilot360 as standard, providing Pre-Collision Assist with automatic emergency braking and Pedestrian Detection, Blind Spot Information System, a LaneKeeping System, rear backup camera and auto high-beam lighting. An available Lincoln Co-Pilot360 Plus upgrade adds Adaptive Cruise Control with Traffic Jam assist, Evasive Steer Assist, Reverse Brake Assist, and Active Park Assist Plus. The 2020 Lincoln Corsair will arrive in US dealers this fall, with production taking place at the company’s assembly plant in Louisville, Kentucky. Pricing details will no doubt be confirmed closer to the sale date.